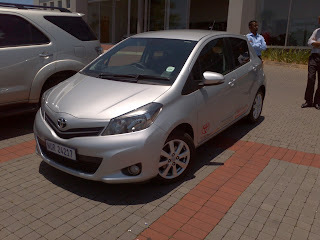 Earlier in 2012, when the new Yaris was released, I thought to myself "what's in this Yaris that cost over R200K?" I meant to check it out but never got around to it. A recent need to change my current car brought me to the Toyota Yaris 1.3XR five door. A buddy of mine, Sachin Barath, from CMH Toyota Umhlanga, arranged a thorough tour of this compact hatch that seemed to be ridiculously over priced. The new Yaris has gone through a 360 degree makeover. The front has been redone to comply with Toyota's new 'Smile Grill', and also totally redesigned and attractive rear end. The XR comes with colour coded bumpers and mirrors, front fog lights, 15" alloy wheels and a rear high boot spoiler, which somehow makes the car much more appealing. Once inside I realised that I was deceived by the exterior design, there was definitely improvements done to the utilisation of space, the interior cabin space was unbelievable for this compact hatch. It appears much more sophisticated, compared to its predecessor, not only appealing to a younger crowd, but also the young professional as well. Leather trim is used for the multifunction steering, gear knob and handbrake. Chrome finishing highlights certain aspects of the dash, but there is an annoying two tone plastic that is used for the dash and I'm sure Toyota has the budget to improve on this, maybe in the face lift version of this new Yaris. There are two major selling points in the new 1.3 XR, that is the technology in the interior comfort features and the technology behind the 1.3 litre engine. Let's start with the interior, all leather trim is stitched with red, which makes it look really sporty. 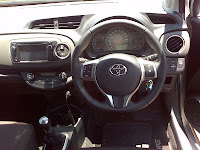 The instrument cluster is now situated behind the steering wheel and not in the centre of the dash. There is also a large touch screen radio that dominates the console, it incorporates USB/Ipod/Aux connectivity which is located in the glove box, and you will be able to listen to your music through 8 speakers.Bluetooth connectivity will allow you to connect to you phone to make and receive calls. There is full auto air conditioning with dual climate control. Toyota has also thrown in cruise control for the long distance drivers. These are just the highlights of the comfort features in the new Yaris XR. Now we get to what's under the hood. The top of the range XR houses a 1.3 litre engine, which outputs 73kw and 125Nm of torque. 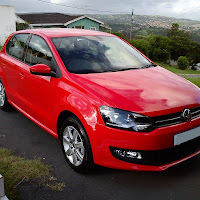 To put you in the picture, VW's 1.6 Polo produces 77kw, Toyota's 1300 engine is in the league of other manufactures 1600 engines. Toyota achieves this power output by using Dual VVT-i (variable valve timing). And what makes it even more impressive is all this power is delivered to the wheels via a six speed manual gearbox. On the highway the little Yaris breezed to cruising speed without showing any signs of stress. I got a real feel of the power on the return trip from Sibaya. While getting back onto the highway I decided to put the pedal to the metal. The acceleration that I achieved was totally unexpected, 100km/h was accomplished in a matter of seconds. If compared to a 1.6 litre in its class, I'm sure the Yaris would perform the same or in some cases even better. 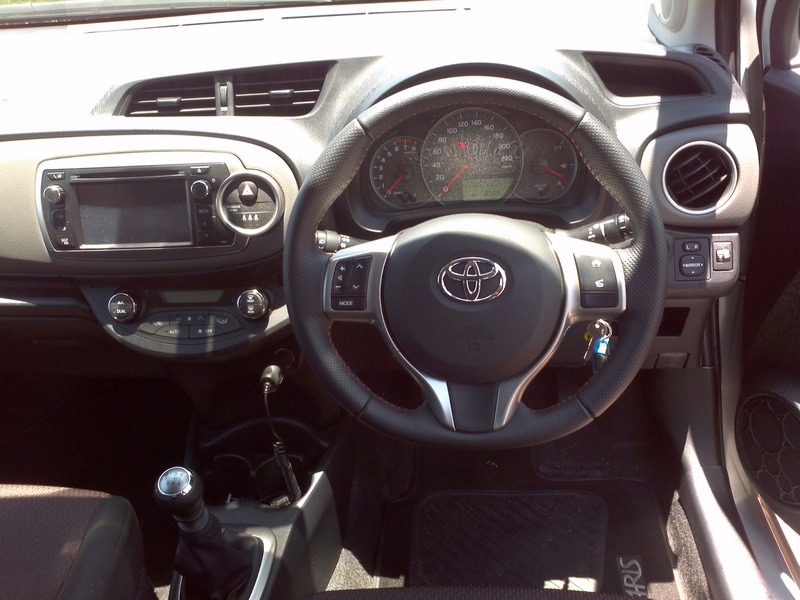 The 2013 Toyota 1.3 XR 5 door clocks in at R206 000.00, considering what is offered and what you pay this is a fair price. You will also get finance deals from Toyota Finance that will make this model lighter on the pocket. 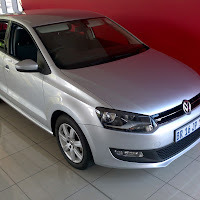 You will get a 4yr/60000km service plan and a 3yr/100000km warranty. Not sure why they didn't extend the warranty to 4 years to match the service plan?!? Which means that if you haven't reached 60000kms in your fourth year you are actually out of warranty and may end up paying for certain failures in the car. The package is attractive, with a price tag that's fair but not too convincing, again if your want one look out for finance deals from Toyota Finance itself.